IQ Articles > What is IQ? How Do You Interpret The IQ Test Scores? There are different types of IQ tests with each having their own scale. Hence two people have an IQ of 120 on different scales might not necessarily have the same intelligence level. However all tests and scales use 100 as the IQ of a person of average intelligence. Since the average IQ is said to be 100, hence anything above 100 is considered as above average and below 100 as below average. IQ below 70 is taken as that of mentally challenged person. IQ above 140 is generally considered as that of a genius. Hence, the normal or average IQ score is 100, which means that the mental and chronological ages coincide. It is true that modern intelligence tests now apply statistical methods to produce a score reflecting one's performance compared to the average performance of his peers. However, the normal or average IQ score will always remain 100. 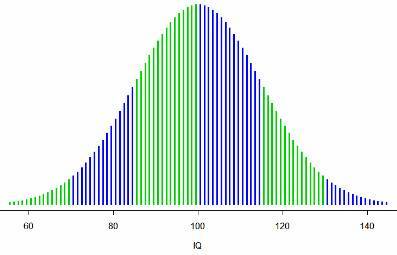 When we plot a sample of the population's IQ scores on an IQ against percentage chart, it is observed that the population distribution on the IQ scale forms a symmetrical bell-shaped curve. This is known as the "IQ Scale Bell-Curve". It reveals that on an IQ scale of 60 to 100, the number of people with those IQ scores increases and maximum people touch the 100 mark. Then, as the IQ scale increases from 100, the percentage of people with those scores starts decreasing in proportion to the start of the curve. A very small percentage of the population reaches an IQ of over 140. From this chart, it can be thus concluded that a normal IQ score is generally considered to be around the 100 mark. IQ scores are thus calculated on a scale of 0 to 200. A person scoring zero would be literally brain dead, while a score of 200 would mean that the person is probably the smartest person alive on the earth. Since the first IQ test was developed by Alfred Binet and Theophile Simon and their IQ was classified on Simon-Binet scale which was later revised by Lewis Terman into Stanford-Binet scale, this is the most popularly used scale till date and all other modern scales also revolves around it. Simply speaking, IQ (intelligence quotient) is an assessment of your ability to think and reason. However, if you want a fuller definition, you have to try and understand the concept of IQ first with utmost patience as it is not a straightforward one. Although IQ is science, it's a fuzzy one. A study at Michigan University led by Swiss postdoctoral fellows Susanne M. Jaeggi and Martin Buschkuehl has revealed that at least one aspect of the IQ - a person's fluid intelligence, which was usually considered to be fixed at birth, can actually be improved.